Space Dragons Dragon Boat Racing Team: Busy Weekend for Space Dragons!! Busy Weekend for Space Dragons!! August 29th and 30th was a very busy weekend for the Space Dragons. Saturday was a full day. Two things were going on. One, practice was cancelled so the team could attend the boat maintenance, and two, the team were having its second yard sale of the year. Saturday, Aug. 29th, Space Dragons volunteers woke up early to work the team's scheduled share of the maintenance of the boats. Some Space Dragons woke up even earlier to go help out with the yard sale. At the boat maintenance, SD sanded the gunwales (gunnels) and benches and applied coats of varnish to the worn wooden parts of the boats. SD volunteers made sure that the gunnels were sanded smooth so we, as well as the other paddlers, don’t get splinters in our paws. Also, the benches were sanded and glossed with varnish with Bob Vila like expertise to pamper our tender little tushies. After all, our tushies take a beating during practice. The least we can do is have them sit on something nice!! It was hard work, but as usual, the Space Dragons made the labor fun. We joked that Child Services may want to question Edie, because her 7 year old daughter, Alex, was working up a sweat sanding and taping the boats. Sometimes it was hard to concentrate on the task at hand when you got Space Dragon crazies like Janice, Blanca, Turtle and Arlene running around. 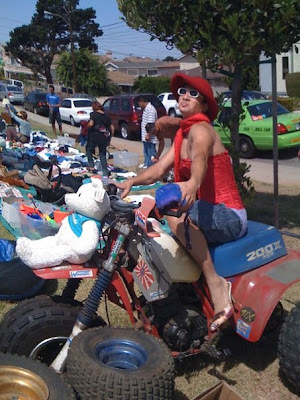 After the boat maintenance, the SD sand and paint team cleaned themselves up and headed out to Redondo Beach to join the othe Space Dragons for the yard sale already in progress. All or most of the proceeds of Yard Sale II 2009 will help lower the tournament cost for paddlers for the San Francisco tournament. SD working Yard Sale II and its patrons.....Ka Ching!! It was not only the Animal that made the yard sale a success. It was a combined effort from all the Space Dragons that attended that made it a success. 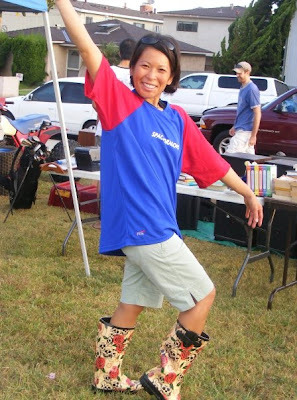 Earlier this year, Yard Sale I 2009, netted over $800 from selling goods (or junks) from SD paddlers. 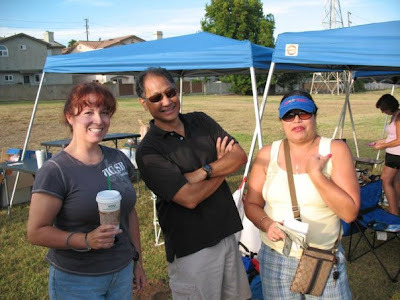 Saturday's take from the Yard Sale II 2009 was over $1200!! Way to go Space Dragons!! Full recap on yard sale to follow courtesy of Denise- Thanks Denise! If female patrons did not find what they wanted on the tarps...they could come out back for hot SD men to take home. Cost for one of these hard bodies? $5!! Sunday, Aug 30th: Practice, more boat maintenance and a surprise birthday luncheon for Ceez. Captain Wade informed the coaches he would not be able to show up for practice on Sunday. He also wanted them to know that three boats would be needed to accommodate all the paddlers that will show up for Sunday’s practice. Wade had planned a “DIE!! PADDLERS DIE! !” type practice for the coaches to ready the troops for the tough competition in San Francisco. Unfortunately, because most of the boats were being maintained, there was only a big boat and a little boat available to take out. Coach Joe “Daddy Tight Shirt” Kurihara did a wonderful job of asking volunteers to sit out and help out finishing up the maintenance of the boats. The others got to go out and paddle. He orchestrated that so well, that I’m sure if he had eight kids, they would all be well behaved and obedient just like us!! Joe told his coaches to take it easy on the paddlers due to the air quality. Later, I heard Joe took out his vet boat out for only an hour. AN HOUR?? LIGHT PRACTICE?? WTH?? Has an alien taken over his body!! Oh my god, the world is coming to an END!! I took the newbie boat for the whole hour and a half. No, I didn’t kill them...the air quality remember!! But they did say that the two 30 second tug-of-wars was probably one of the hardest things they ever did since they started paddling. On the way back, not long after beaching on the shore, Devant, did his best imitation of a linebacker and executed a flying tackle, knocking me off the boat and into the drink. Ahhh yes, I forgot, it's my birthday!! Anyhoo, what the hell is a young whippersnapper like Devant knocking an old guy like me, with bad legs, off of a boat for?? I wanted to give that dang kid a timeout…and take away his video games!! Another thing of importance. It was broad daylight, but we saw a moon out. Brian’s moon!! Brian grabbed Tran and carried her to the water for a dunking. Tran tried her best to do a Pearl, and tried to kick her way out of Brian’s arms. When that didn't work, Tran tried pulling off Brian’s shorts exposing his bum to attempt to halt his progress, but to no avail. Brian didn’t give a rat’s ess…she still went in!! White Moon of Brian out in full view. The Award ceremony. Space Dragons were told to gather on the grass. Captain Tran gave an inspiring speech on the successes of the White, Blue and Red boats in the Big Long Beach tournament. Her speech touched everyone ever so deeply. As Pomp and Circumstance (graduation march song) played on a boom box, proud Space Dragons accepted their well deserved medals from Tran, a shirtless Scott Matsunami and Marina. This is what its all about baby!! Dedication + Hard work = Hardware + a slim lean body like Galen's (Ed note: hahahahaha! )and/or Emily's. I later found out that Deej had planned a surprise birthday party for me. Bless her heart. I love that lady!! That love turned to hate because it didn’t matter that I changed my birthday on Facebook to March 30th. Because of her, everybody found out Sunday was my true birthdate anyway!! And what did it get me?? 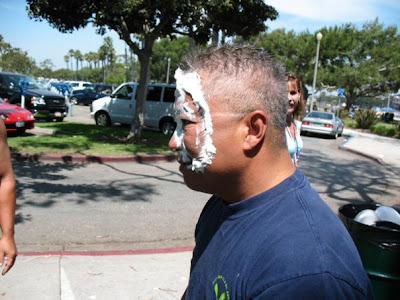 I got tackled violently off the boat by some young man and I got chased around the parking lot, running as fast as I can on my fragile creaky legs, to avoid a plate of whipped cream to the face. It didn't matter because some big newbie guy named Steve, held my legs to immobilize me and I got it anyway. He will pay with some solo power sets!! DIE!! Whoever was involved with this....DIE!! Space Dragons, mucho thanks to everyone who came in to lend a hand and their tools for the boat maintenance. Thanks Steve from the Association to help organize it. The boats looked awesome!! Gracias to all of those who donated their goodies and time to the yard sale and to those who help sell them. 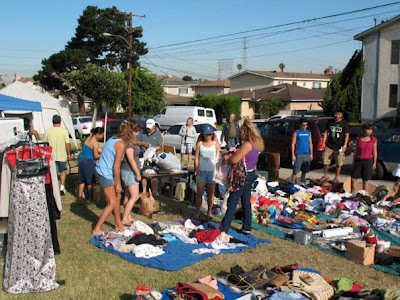 It was hot as hell out there, but SD braved the heat and still made it another successful yard sale. Each one surpassing the other in sales!! Love to see everybody come out and have some lunch and celebrate my… er….37th birthday. It was great fun. Thank you Deej and all who help make it possible. The Space Dragons were busy last weekend. It's time to get busy again people!! Busy training for San Francisco! !